DMA conducted a multi-task, GIS-based spatial analysis project to support NEPA documentation and implementation of the long term maintenance and creation of emergent sandbar habitat (ESH) program; conceived to mechanically favor riparian habitat along the Missouri River that is suitable for nesting and fledging of endangered least tern and piping plover populations. The project entails the delineation of the program spatial limits (the riparian corridor) for more than 400 miles of free flowing reaches of the Missouri River. The delineation of habitats within the riparian corridor; particularly ESH, the identification of features and values that should not be subject to the negative affects of ESH maintenance activities. GIS work also supported the preparation of an implementation manual; stating the practices and procedures (and their environmental effects) that will be used to maintain and create ESH. Habitat was mapped using aerial photographs from 1998 (representing post 1997 flood sandbar maxima), to determine the area of maintenance and creation obligation. Data from various state and federal sources, and heads-up digitized data supported immediate NEPA decisions, served as a baseline for future habitat spatial assessments, and directed the initial years of planning and construction for the ESH implementation. DMA developed the study’s Planning Objectives, Constraints and Problem Identification, planning and executing a Public Involvement Action Plan, and formed a Technical Coordinating Committee to assist in executing the Feasibility Study. DMA prepared the F3 Existing Conditions Report, and the F4 Alternative Formulation Report to identify the NER plans for ecosystem restoration and preservation alternatives. DMA prepared an F3 report and assisted the District in the preparation of an F4 Plan Formulation Report (development of alternative restoration plans) for the Tres Rios Del Norte project in Arizona. DMA prepared the draft and final reports based on technical input provided by the Los Angeles District. Activities performed by DMA included: data review and preparation of a technical memorandum documenting data sufficiency and data gaps; project team meetings and site visits; review, evaluation, and supplementation of project plan formulation. DMA formulated and evaluated alternative plans for the Paseo de las Iglesias study. Services included plan formulation/evaluation during the F4 phase of the study. Specifically, DMA formulated alternative water resource measures; evaluating and revising formulated alternatives; and incorporating results, findings and recommendations into the Main Report Document. The alternatives addressed various water resources objectives including environmental restoration, flood control, water quality, water conservation, recharge, and recreation. As part of this work, DMA prepared preliminary sketches and completed additional design and analysis for use by cost estimators for the six best alternatives identified in the preliminary screening as agreed by the District and the Sponsor. DMA prepared an F3 report and assisting the District in the preparation of an F4 Plan Formulation Report (development of alternative restoration plans) for the El Rio Antiguo, Rillito project in Arizona. DMA prepared the draft and final reports based on technical input provided by the Los Angeles District. Activities performed by DMA included: data review and preparation of a technical memorandum documenting data sufficiency and data gaps; project team meetings and site visits; review, evaluation, and supplementation of project plan formulation. Following DMA’s successful completion of the Powell River Basin Feasibility Studies, DMA and a team subcontractor prepared Plans and Specifications (P&S) for the four project sites. Activities performed included: HTRW investigations and analysis, additional geotechnical investigations and analysis, preparation of P&S-level designs and construction drawings, preparation of construction specifications, preparation of the government bid estimate, additional surveying for geotechnical borings and disposal areas, and Indiana Bat (Federal T&E species) specimen tree surveys. In addition, DMA conducted continuing coordination with the non-Federal sponsor, the Virginia Department of Mines, Minerals and Energy, and Federal and state resource agencies. DMA performed the reconnaissance phase investigations to evaluate the Federal interest in implementing solutions to water resource problems and addressing ecosystem restoration opportunities in the Hudson-Raritan Estuary, New York and New Jersey. The focus of the study was to identify large or otherwise significant areas of estuarine and coastal habitat where ecologically significant restoration could be accomplished. Because the study area is large and ecologically complex, it was necessary to quickly, accurately and thoroughly identify and categorize potential habitat restoration opportunities. Numerous Federal, state, and local agencies have jurisdiction throughout the study area; therefore it was essential to coordinate with and insure participation by all stakeholders during the site selection and prioritization process. DMA’s roles in the reconnaissance study were to develop and produce (1) the Section 905(b) (WRDA 1986) Preliminary Analysis Report, (2) three Project Management Plans that define the products and describe the tasks to be accomplished during three feasibility studies, and (3) an itemized budget and schedule for each feasibility study. During the feasibility phase, DMA is providing support to the New York District in preparing a Feasibility Study QC Plan and QC Reports, defining the restoration goals for each of the thirteen sites, developing site-specific agency and stakeholder contact lists, determining site-specific feasibility study schedules, budgets, and milestones, and collecting existing and usable data that can be applied to each feasibility study. DMA conducted engineering, environmental, and plan formulation activities in support of the Section 206 feasibility study. DMA activities included: review of available data, site reconnaissance, development and implementation of a comprehensive water quality sampling program, hydrologic and hydraulic investigations, preliminary design and cost estimating of restoration features, preliminary economic and socio-economic analyses, environmental and fish and wildlife studies, public and agency involvement, and formulation and screening of alternative plans. DMA prepared the DPR and EA for the feasibility phase of the Spring Creek Aquatic Ecosystem Restoration study. Work under this task order required DMA to conduct baseline studies including survey and mapping, hydrology and hydraulics, cultural resource studies, environmental studies, economics, and preliminary formulation and screening of alternatives. Project alternatives evaluated during the feasibility phase consisted of flood plain restoration, wetland and aquatic habitat restoration, and stream bank protection along Spring Creek. DMA conducted a survey for the endangered Topeka Shiner in the headwaters of the Big Sioux River, near Watertown, South Dakota. 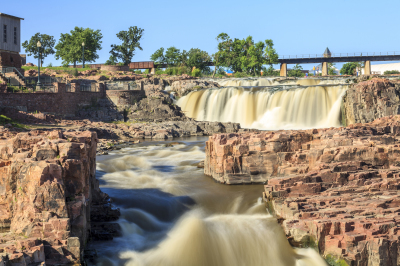 The presence/absence survey was conducted to provide documentation for the Flood Control for Watertown and Vicinity, South Dakota feasibility study prepared by the Omaha District. Services required under this project included the identification and mapping of all potential Topeka shiner habitat locations in the 8000-acre estimated 100-year flood pool perimeter, obtaining all state and federal sampling permits, obtaining landowner permissions to access the habitat areas, sampling of 13 reaches at, above and below the proposed dam location and report preparation. For the Jacksonville District, DMA provided projections of socio-economic indicators for without project conditions, CERP (alternative futures), and then conditions with the implementation of four key CERP projects, which will impact rural agricultural based economies (implementation scenarios). DMA answered three key questions regarding the affected areas: 1) What would be the likely development patterns without CERP? 2) What impacts will these CERP projects have on these areas? 3) What can be done to mitigate negative impacts and take advantage of opportunities? The goal of this project was to provide the New York District with: (1) a systematic framework and (2) a preliminary evaluation of the potential benefits and costs associated with five candidate scenarios for handling dredged material from NY/NJ waterways. The five scenarios examined for potential beneficial uses of dredged material include: Brownfield Site Remediation - OENJ Bayonne Site; Coal Mine Acid Drainage Mitigation - Lehigh Anthracite Mine; Aquatic Habitat Restoration - Norton Basin; Landfill Closure - Pennsylvania Landfill; Quarry Closure - Hunterdon Quarry. DMA conducted a without-project, existing conditions analysis of the Morro Bay Estuary Study Area, and prepared a Without Project Conditions Integrated Main Report. Activities performed by DMA included: developing planning objectives, constraints and problem identification; planning and executing a public involvement action plan; formulating preliminary alternatives; and forming a Technical Coordinating Committee to assist in executing these activities. The Integrated Main Report included formulation of ecosystem restoration and preservation alternatives, with preliminary evaluation of these alternatives based on the planning objectives, constraints, costs, and environmental effects and results. DMA prepared Section 1135 & 206 Preliminary Restoration Plans for Improvement to the aquatic ecosystem for: Lorraine Pile, Pergrin Run, PA; Conemaugh Lake, PA; Saxman Run, Loyalhanna Lake, PA; Deer Lakes, Allegheny County, PA; and Wheeling Creek, OH. The five projects addressed coal refuse piles, acid mine drainage, lake sedimentation, and aquatic habitat improvements. DMA identified degraded ecosystem elements for each project, formulated project alternatives and quantified their ecological outputs, estimated project costs, and prepared the draft and final PRP’s. DMA developed a screening process and conducted cost effectiveness and incremental cost analysis of mitigation alternatives for the proposed flood control dam in the Levisa Fork Basin. DMA formulated a linear programming model to evaluate the most cost effective mitigation plan for three subcategories of mitigation: terrestrial, aquatic and riparian. For each subcategory, combinations of mitigation measures were developed to meet specified mitigation targets. The linear programming model selected the least cost plans to meet specific mitigation goals subject to technical constraints identified by an inter-agency team of ecologists and biologists. The results of the cost effectiveness and incremental cost analysis were used to identify optimal plans in each subcategory -- the optimal plans were combined to determine the most cost effective mitigation program. This analysis resulted in a 78 percent reduction in mitigation costs. DMA developed and quantified mitigation obligations for system impacts associated with lock and dam rehabilitation and upgrades for the Winfield Locks and Dam replacement project. DMA formulated the mitigation plan, including designs and cost estimates for systems impacts. Specifically, DMA developed ecosystem restoration alternatives for the Kanawha River and conducted cost effectiveness and incremental cost analysis to identify the recommended mitigation plan. DMA also prepared the draft mitigation plan and assisted the District in coordination / negotiations with state and federal resource agencies. In the Water Resources Development Act (WRDA) of 1986, Congress created the Section 1135, Project Modifications for the Improvement of the Environment program. Section 1135 provided the authority to the Corps of Engineers to implement projects to reverse environmental damage that may have been caused, or exacerbated, by previous Corps projects. The Water Resources Development Act (WRDA) of 1992 marked another significant change in policy direction for the Corps Civil Works Program. The Act authorized the Secretary of the Army to “...include environmental protection as one of the primary missions of the Corps of Engineers in planning, designing, constructing, operating and maintaining water resources projects.” In addition, the Act further established as goals, “no net loss of wetlands” and “an increase in the quality and quantity of the Nation’s Wetlands.” Most recently, in WRDA 1996, Congress extended the Corps’ mission in ecosystem restoration to its Continuing Authorities Program, creating the Section 206 Aquatic Ecosystem Restoration program to address smaller (i.e., Federal costs < $5 million) restoration efforts. DMA has extensive experience in this rapidly expanding new mission area and has participated in the planning and design of environmental restoration projects, and in the design of environmental mitigation plans. Examples of our recent environmental restoration and mitigation projects are described below. DMA conducted an expedited reconnaissance study to evaluate potential solutions for reversing ecosystem degradation due to: acid mine drainage from abandoned mine lands, stream erosion and sedimentation, and wetland degradation in the North Chickamauga Creek Watershed. Acid mine drainage and surface erosion from past mining activities have led to deteriorated water quality and wildlife habitat in the basin’s aquatic ecosystem. Other related water resource problems addressed in the reconnaissance study included stream bank erosion and sedimentation, flooding, storm water management, and non-point source pollution. Following completion of field reconnaissance, DMA prepared the Section 905(b) Preliminary Assessment. DMA also prepared a detailed list of tasks (and task descriptions) to be conducted during the feasibility phase for inclusion in the project management plan. DMA supported the Jacksonville District in the economic analyses of the Central and Southern Florida Comprehensive Review Study (C&SF Restudy). The Central and Southern Florida Project, authorized in 1948, is a system of levees, canals, water control structures, and management operations that were primarily designed to provide flood control and water supply to southern Florida. DMA evaluated the economic impacts of the alternative restoration plans. This required comparison of the differences between conditions estimated to exist in the future with and without implementation of a plan. DMA evaluated the potential economic effects of these plans on agricultural water use, municipal and industrial (M&I) water use, commercial navigation, recreation, and commercial fishing. DMA conducted an economic analysis as part of the Jacksonville District’s effort in estimating the effects of alternative regulation schedules for Lake Okeechobee. Lake Okeechobee is a large, natural, shallow, freshwater lake located in the central part of the Florida peninsula. Historically, Lake Okeechobee has been regulated with the goals of meeting multiple objectives, water supply and flood control. However, environmental concerns for the lake’s littoral zone and disruptions to overland flows through the vast wetland complex in South Florida, including the Everglades, have increasingly become competing objectives. The purpose of the Lake Okeechobee Regulation Schedule Study was to develop a regulatory schedule for the lake that more effectively balanced these competing objectives. DMA’s investigation addressed the economic tradeoffs among these competing objectives. DMA’s analysis consisted of estimating the economic consequences for agricultural and urban water use, for navigation and recreation, and for commercial fishing which may be associated with alternative lake regulation schedules. Economic impacts were analyzed in terms of both net national effects (NED) and regional effects (RED). DMA conducted a reconnaissance study to evaluate environmental restoration opportunities and water quality improvements to Flushing Bay and Creek. DMA led the plan formulation effort, defined environmental restoration objectives, proposed preliminary restoration options, and formulated management plan alternatives to address ecosystem restoration, water quality improvement, navigation/anchorage concerns, recreation opportunities, and impacts on the local economy. DMA performed cost effectiveness and incremental cost analyses of alternative plans, and organized and facilitated meetings of Federal and non-Federal interest groups to assess interest and support for continued studies. The product of the study was a Reconnaissance Study Report and Project Management Plan for the feasibility phase. DMA performed a Cost Effectiveness and Incremental Cost Analysis of ecosystem restoration plans for acid mine drainage abatement on Piedmont Lake / Lick Run. The analysis involved an incremental comparison of the costs and ecological outputs of a variety of management measures and treatments for improving fisheries habitat in Piedmont Lake. DMA performed the analysis using the “Nine Easy Steps” approach and the WES / IWR Cost Effectiveness Analysis model. DMA conducted an expedited reconnaissance study to evaluate potential solutions for reversing ecosystem degradation due to abandoned mine land drainage in the Hocking River Basin, Ohio. Acid mine drainage and surface erosion have led to severely deteriorated water quality in the basin’s stream and riverine ecosystems. DMA identified on-going and historical water planning efforts, characterized the study area’s water resource problems, formulated restoration / reclamation alternatives, and evaluated the likely benefits, costs and environmental impacts for each alternative. These alternatives included both physical (grading and shaping, re-vegetation, anaerobic sub-surface wetlands, constructed wetlands) and chemical (sulfate reduction via organic matter, alkaline additions, open limestone channels, metal adsorption on fly ash, limestone dosing) treatment options. Additionally, DMA estimated the time and cost to conduct an in-depth feasibility study as well as assessed the level of interest and support from non-Federal entities in cost sharing for the feasibility phase and project construction. DMA conducted a cost effectiveness / incremental cost analysis of alternative restoration plans. DMA performed the analysis using the “Nine Easy Steps” approach and the WES / IWR Cost Effectiveness Analysis model.